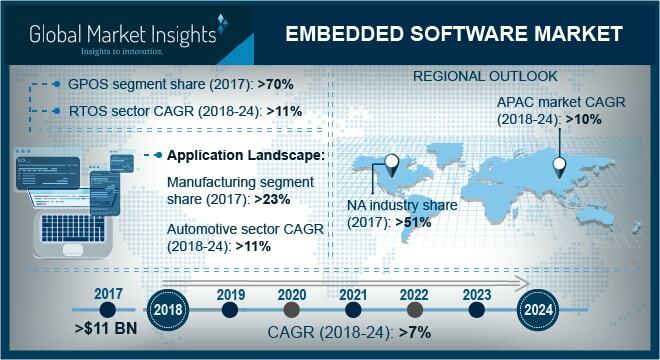 Embedded Software Market size is set to exceed USD 19 billion by 2024; according to a new research report by Global Market Insights, Inc. The embedded software market growth is attributed to the increasing adoption of smart devices in the consumer electronics and healthcare sector. The deployment of IoT technologies in smart and connected devices has enabled the end user to establish cross-device connectivity and implement smart features in operating systems. The use of IoT-enabled OS assists the user to control the home appliances remotely through smartphone/tablets. Further, such technologies help the consumer electronics companies to boost their production and operation processes by around 40%. In addition, efficient power consumption and high cost savings are also anticipated to augment the embedded software market. The increase in demand for open-source Linux software and open-source RTOS software is expected to offer lucrative growth to the embedded software market. As per GMI analysis, the worldwide shipment of open-source real-time operating systems has increased by 8.5% in 2017 as compared to 2016. The use of real-time systems enables the user to develop functional firmware in highly compressed timescales. Moreover, it also supports the custom Board Support Package (BSP) as per the user’s requirement. The primary advantage of open source RTOS is low power consumption that helps MCUs to increase the processing speed by around 20%. The RTOS segment in embedded software market is projected to register a CAGR of more than 11% due to a surge in the demand for special-purpose hardware using real-time systems such as ThreadX, Windows CE, Fusion RTOS, LynxOS, and VxWorks. The RTOS-enabled software uses a round-robin scheduling process that reduces the hog in the CPU and performs an error-free process in real-time. Such systems offer mission-critical and safety-critical applications to various industry verticals such as military, healthcare, manufacturing, and the automotive sector. Furthermore, such software supports multitasking and inter-task communication that helps the engineer to perform complex applications simultaneously. It also supports all the microcontrollers and microprocessors that include different memory sizes such as 8-bit, 16-bit, 32-bit, and 64-bit systems. In June 2018, Green Hills Software partnered with Paragon software to integrate its Integrity RTOS with Paragon’s file system link to support various file types into the system. The standalone system held a market share of more than 73% in 2017. The growth in this segment is attributed to an increase in the demand for the traditional system by a majority of end users present in the embedded software market. Such systems can function autonomously without any help from the host computer as it encompasses its own OS software, user-created files, and virtual memory space. Further, the system can share the information with other systems on the network even if it is detached from the network. Digital cameras, video games consoles, mp3 players, and temperature measurement systems are some of the major applications of standalone systems. The real-time system in embedded software market is projected to register the highest growth with a CAGR of more than 12% during the forecast period. The growth in this segment is attributed to error-free task management and the use of preemptive kernel method in the system. The real-time system is classified into two types, soft and hard. The soft RTS offers less accuracy and strictness on time while hard RTS delivers the exact output at the required time. The manufacturing sector held more than 23% embedded software market share in 2017 due to the evolution of Industry 4.0 manufacturing with seamless IoT connection. A surge in the demand for IoT-enabled OS allows the manufacturers to remotely monitor the product’s statistics and automate the device-to-analytics data flow. The adoption of RTOS software facilitates the enterprises to monitor the changes in the production on a real-time basis, increasing the operational excellence in the manufacturing sector. In July 2016, Advantech launched 7” WebOP-2070T TFT that supports WVGA operator panel with web access/HMI software. This strategic move helped the company improve the manufacturing efficiency and decrease its labor cost. The Asia Pacific embedded software market is expected to record a CAGR of more than 10% over the forecast period. In July 2018, Chinese chip manufacturer, Chengdu Haiguang IC Design Co., has started the development of the x86 processors named “Dhyana” that includes their operating system. This strategic move helped the Chinese manufacturers to reduce their dependence on the operating systems of the U.S. A surge in disposable incomes of developing countries including India, Japan, and South Korea will also augment the embedded software market.